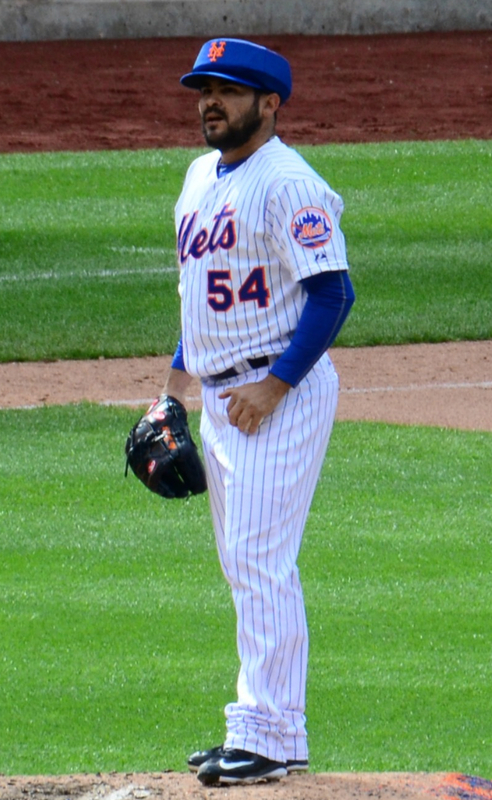 “Alex Torres on April 23, 2015” by slgckgc on Flickr, Cropped by UCinternational. In yesterday’s post, I made reference to Terry Collins‘ maddening habit of treating Alex Torres as a left-handed specialist against all better evidence. In 17 of Torres’ 33 appearances, he’s faced three batters or fewer; those numbers are similar to bridge man Hansel Robles‘ 26 appearances, in which 15 appearances have faced three batters or fewer (each has faced a maximum of eight batters). Robles’ median appearance is a full inning pitched, whereas Torres’ median was 2/3 of an inning. 19 of Torres’ appearances have come in a clean inning, whereas Robles has come in 16 times to start an inning and twice more with one batter on but 0 outs. Overall, the two pitchers are being used in very similar ways, except for one major factor: Almost 48% of the batters Alex Torres has faced are left-handed, as opposed to a hair over 38% for Hansel Robles. Against righties, Torres has a .297 OBP-against, compared to Robles’ .328, neither being much to write home about. (Closer Jeurys Familia allows a .225 OBP against right-handers and .254 against left-handers, and reliable eighth-inning dude Bobby Parnell carries .294 against righties and .222 against lefties, in a very limited sample this year.) But against lefties, Robles strictly dominates Torres. Robles has a .222 OBP allowed against right-handers, which is as good as Parnell and a smidge better than our closer. But Torres, who’s faced 59 lefties, more than anyone except Familia? Torres allows a monstrous .407 OBP when facing left-handers! That’s the worst platoon split of any active Mets pitcher. Not only is Alex Torres not even better facing lefties than righties, he’s so bad that Alex Torres Against Left-Handers should be sent down to keep Alex Torres Against Right-Handers on the roster! If Left-Handers Against Alex Torres were a single player, they would rank #3 in OBP in the National League, ahead of Anthony Rizzo with .405. Both Parnell and Robles are better against lefties than righties, but Parnell should be comfortable in his eighth-inning role. Why not bust out Robles against lefty-heavy lineups and see if he can keep up his difference? But for heaven’s sake, quit using Alex Torres against left-handers.